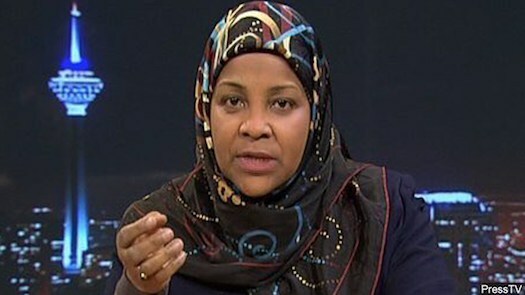 WASHINGTON—Even though she was never charged with a crime, U.S. born Iranian TV journalist Marzieh Hashemi was detained, often shackled by federal authorities for 10 days because, she insists, the U.S. government wants to intimidate her and those who would support her. Ms. Hashemi was released from federal custody, but she remains defiant, urging her supporters to fight on—and challenge American wrongdoing. A news anchor for Iran’s English-language Press TV, she had been held in jail to force her to testify before a federal grand jury in Washington. “As you know, I made the call for everyone to continue to come out today even though I gained my freedom a couple of days ago and the reason was and is as I’ve been saying in various interviews, is that this is not about (U.S. officials getting) harsh on me. 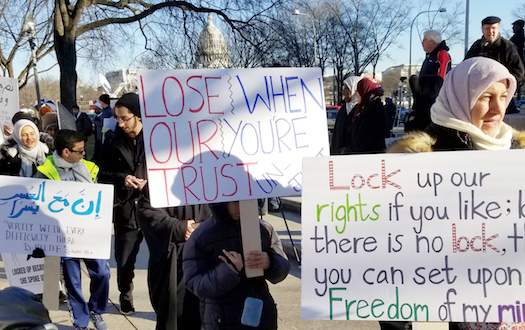 This is the U.S. government and thinking that they can do this to anyone at any time without facing any ramifications,” Ms. Hashemi told 200 supporters Jan. 25 at a rally outside the courtroom where she testified. She had been released from federal custody two days earlier. “Make no mistake. They can call it whatever they want to call it, but I was kidnapped,” Ms. Hashemi said, describing her arrest. That arrest, she said is linked to her tireless reporting about racial and anti-Islamic bias throughout U.S. society. She remained steadfast. “We will not be intimidated. We will not back off the truth, no matter the price,” she said to a broad band of supporters. Other support rallies were held in Iran, Pakistan, the United Kingdom and in New York and other cities in the United States and around the globe. Journalists for foreign, state-run media should be concerned, she warned, about what she described as an attempt by the U.S. government to intimidate her news outlet because it airs opposing views. She was taken into custody at the St. Louis airport on Jan. 13, and then transported by the FBI to Washington. 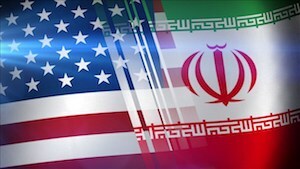 After initial news reports by Iranian media, the FBI and other law enforcement agencies declined to confirm the arrest for several days. Finally, the U.S. government, in a court order unsealed Jan. 18, confirmed it was holding Ms. Hashemi (who was referred to by her birth name Melanie Franklin in the court filing) pending testimony in a sealed criminal matter, and that she was not accused of any crime. She was arrested under a material-witness warrant. Demonstrators protest detention of Iranian journalist Marzieh Hashemi by federal authorities. Photos: Askia Muhammad. 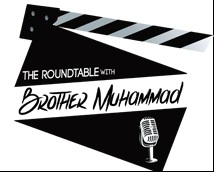 During the Honorable Minister Louis Farrakhan’s visit to Iran last November, Ms. Hashemi interviewed him about his impressions about Iran, how he was received in the Islamic Republic, the Black struggle for justice in America, U.S. power and influence and other subjects. 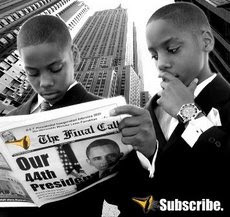 They talked about the failures of the American government to deliver on its promises to Black people. In answer to her question, Min. 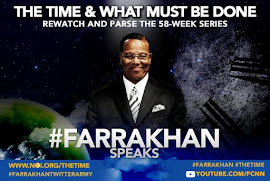 Farrakhan said Black suffering in America has proved Whites are disagreeable to live with in peace and Blacks must have a nation of their own. Blacks suffer from tainted water in Flint, Mich., and other places and these conditions are part of a “genocidal plot” against Black people, said Min. Farrakhan. “Every glimmer of hope has brought us nothing,” he said. “Trump seems to relish the evil that he says and the evil that he does, but today, that man walked out from behind the podium … They’re very antagonistic to him and now that they have put the Democrats in power in the House of Representatives, there is no telling where this thing is going to go in the next couple years,” Min. Farrakhan said. Min. Farrakhan also said he was honored to sit with Ms. Hashemi, saying her role with Press TV was important. “Our people in America would be moved to hear you, to see you, because though you live in Iran you are very up to date with everything that is happening to your people back in America. And you have wisdom, you are not somebody who sees and doesn’t know,” he said. Ms. Hashemi is a dual U.S.-Iranian citizen who has worked in Iran for about 25 years, who is married to an Iranian man, and who is a mother and a grandmother. She was in the United States to visit an ailing brother and to complete a documentary on the Black Lives Matter movement when she was detained. She has become an internationally recognized journalist on Press TV, an outlet that—like the British Broadcasting Corporation in the United Kingdom—receives most of its support from the Iranian government. The anti-war group March On the Pentagon said, “Aron Trainin, the Soviet legal scholar whose work helped serve as a basis for the Nuremberg Charter, said that ‘crimes against peace’ included ‘acts of aggression’ and ‘propaganda of aggression.’ It is in that context that we view the FBI’s illegal seizure and holding of truth-telling journalist Marzieh Hashemi, a Black American grandmother who is a world-renowned news anchor for PressTV. “Her abduction reflects all the worst of this administration’s racist, misogynist, anti-Muslim, anti-journalism tendencies. We also cannot condone the silence of the corporate media on this matter—the same media that gave Trump tens of millions of dollars of free campaign publicity and continues to promote his every word. It is ironic that the same mainstream media that cried out in horror over the abduction and murder of Saudi journalist Jamal Khashoggi, or the banning of CNN’s Jim Acosta from White House press briefings, are largely silent about the government’s kidnapping of a Black woman who is also a Muslim and a U.S. citizen,” said the group. “It seems that this had to do with Iran and it seems that it’s part of intimidation of people who work with Iran,” Medea Benjamin, co-founder of CODEPINK: Women for Peace said in an interview. “There was no reason to keep her in prison, to have her be a material witness. She just could have been asked to appear and she would have appeared. So keeping her locked up for the time that they did and having her appear three different times. It seems like that was a form of intimidation. “I was really impressed the way a broad community came together to support her,” Ms. Benjamin continued. 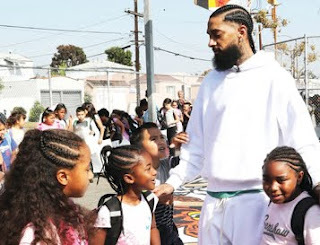 “It was a community that included the Muslim community; many people in the peace community; folks in the Black community because she had been involved in doing videos and work around Black Lives Matter. And so, it was a pretty widespread group that came together and said, ‘We demand answers,’ and put in calls to the Justice Department and State Department. 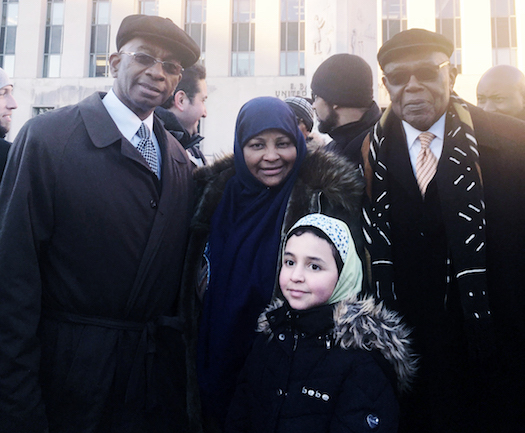 The Nation of Islam has been steadfast in defense of Ms. Hashemi, and in support of the Islamic Republic, according to A. Akbar Muhammad, international representative of Minister Farrakhan and the Nation of Islam. 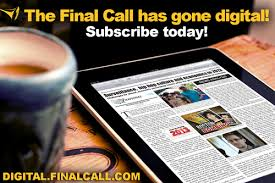 “In 1979 Minister Farrakhan put Ayatollah Khomeini’s remarks in The Final Call newspaper. 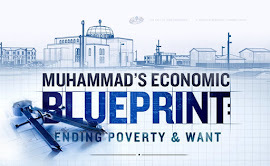 In January 1996, Minister Farrakhan was the first outsider to address the national celebration of the Islamic Revolution in Tehran,” Mr. Muhammad said in an interview. “Anybody that has anything to do with Iran is really in the crosshairs of the Trump administration right now,” said Ms. Benjamin. When this ordeal began, for two days, Ms. Hashemi’s family had no information on what had happened to her. When she was finally allowed to communicate with her children, they were shocked to learn that she had “been disappeared” by the FBI and moved to a detention center in Washington, D.C., where she was subjected to degrading treatment, including the forcible confiscation of her hijab (headscarf), constant surveillance, disrespecting her Islamic diet, and not informing her as to why she was being detained. 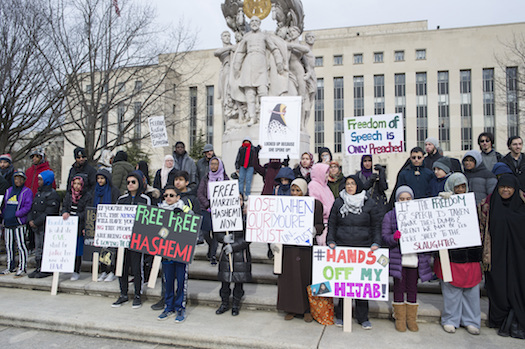 “I was kidnapped, make no mistake, it can be called whatever they want to call it, but I was kidnapped from the St. Louis Airport,” Ms. Hashemi told the rally. “Fortunately my son Razah was with me. Otherwise, who knows what could have happened? You can disappear. You can be made to disappear very easily and the case can be sealed and so there’s no way that you can find out because of national security. “I want them to know and I thank all of you also, that we cannot be intimidated, that we will not back off from the truth, no matter the price, no matter the price. 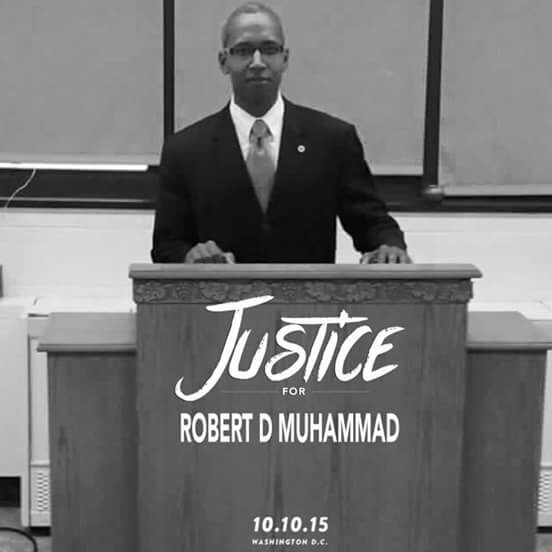 “I don’t know how long we’re going to tolerate this kind of injustice. They can say that it is legal, but I know all freedom loving people around the world know that illegally detaining, I will say kidnapping, transferring, shackling, imprisoning, taking off my headscarf and so many other things. They can call it legal but we know that it is not legal. “We have one life to live, so make it count. I will give it all I have. I will one day die. We all will die. So make sure that your life counts for something. Stand up for the oppressed. Stand up for your people. “So if I’m not charged with a crime, then God help those who are charged with crimes, brothers and sisters. The reason why I wanted these demonstrations to continue today is because what happens to the average Joe, Ali, on the street who doesn’t have money? “So you can either deal with it and resist, or you can acquiesce and cave in because of fear, but I’m going to tell you something at the end of the day, if you fear, if you don’t speak out, if you don’t do anything about it, it will get worse and worse and worse. “Come on back down. You can come pick me up. Pick me up again right now and take me to jail. Someone can take me out, but I am telling you and I promise that I will make my last stand against oppression!” she declared.